Thank you for all the lovely comments I've been left recently, I will get around to replying soon!! Even though the doggy of doom is not yet finished (all knitted now being sewn up and stuffed) I needed another project to get my teeth into. 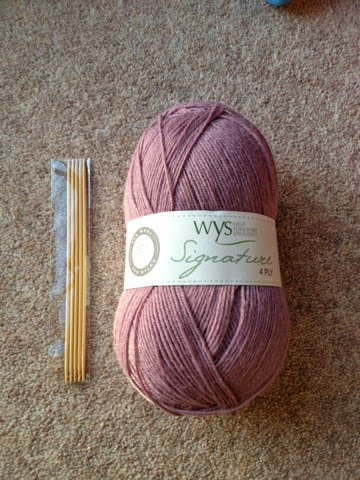 So armed with my new dpns and 100g of wool I'm going to make a start on Christina's January socks. I'm excited for you! The color of the yarn is really beautiful. I like the colour of the yarn as well, it's lovely. I admire anyone who can manage socks, it's something I'd like to try one day. I'm working up to it! I need to start a new knitting project as well, it's always fun to start a new thing.